Several years ago we planted distinct varieties of bee balm and wild bergamot, now they seem to have hybridized and we are seeing a color spectrum of blossoms. 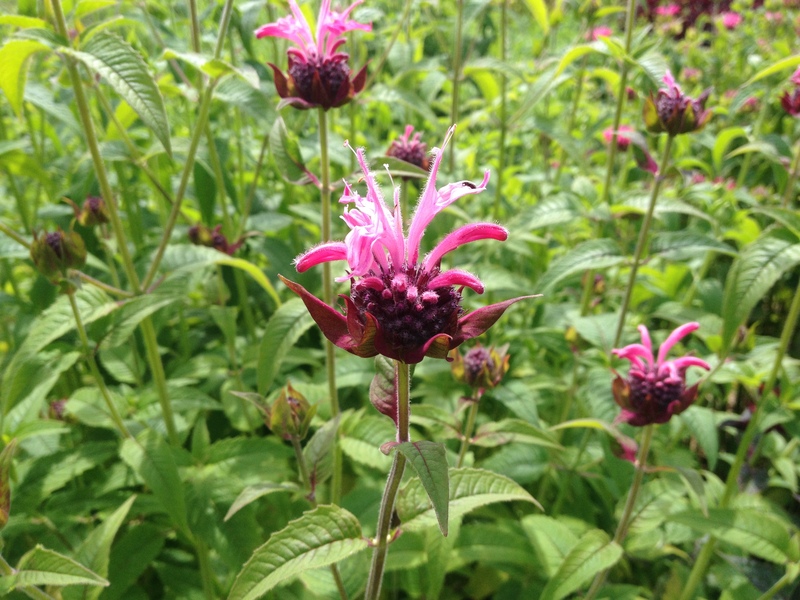 Monarda was used by many Native American people for treating colds and was often consumed as a tea. It has strong antiseptic actions and is used to treat mouth and throat infections as well as excessive flatulence. It is also used in treating candida with tincture or tea. Our leaves consistently get powdery mildew, but we haven’t found a significant difference in taste between leaves with and without the powdery mildew. Enjoy as a tea, try combining with other herbs with gentler flavors such as oats. Make a tincture extraction of bee balm to use alone or in combination with other herbs for digestive upset such as fennel, burdock, orange peel, catnip and cinnamon. Monarda has a pleasant pungency which lends to a flavorful infused vinegar. Plus the flower petal’s red color infuses into the vinegar as well. Bee Balm makes a delicious infused honey. Enjoy in tea or drizzled on dessert.